Assange is still holed up in Ecuador’s London embassy, in a bid to avoid extradition to Sweden to face questioning on sexual assault allegations. WikiLeaks claims that some of the documents to be released will demonstrate a systematic programme of unaccountability, when it comes to the way military prisoners are treated by the US. A 2005 file detailing a ‘Policy on Assigning Detainee Internment Serial Numbers’ will apparently cover the ‘disappearing’ of detainees “into the custody of other US government agencies while keeping their names out of US military central records”. Meanwhile, a 2008 ‘fragmentary order’ will purportedly show how the documentation of interrogations is kept to a minimum. It remains to be seen whether these files come from the same massive leak that has landed soldier Bradley Manning, the alleged leaker, in military detention. There are many small-scale whistleblowing services that have popped up in the wake of WikiLeaks, although none have achieved the same renown. Anonymous, the hacker collective, is apparently gearing up to launch its own service called Tyler later this year. 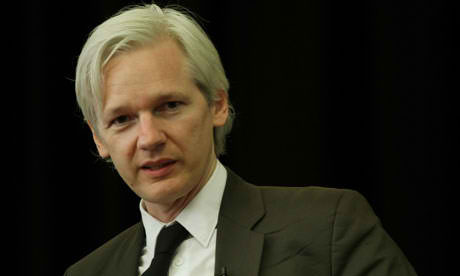 Julian Assange discusses leaked documents detailing U.S.
Posted on October 25, 2012, in Human Rights and tagged Bradley Manning, Camp Delta, Cuba, Ecuador, Julian Assange, London, United States, WikiLeaks. Bookmark the permalink. 4 Comments.